If you or your children are involved in sports, a mouth guard should be considered an essential piece of equipment for preventing tooth damage and other mouth injuries. According to the American Dental Association, athletes who play sports with a mouth guard are 60 times less likely to damage their teeth than those who don’t use one. Both contact and non-contact sports can put you at risk for oral injures. 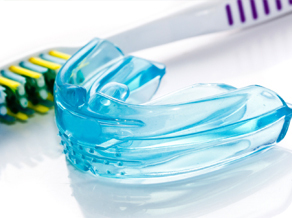 A mouth guard will shields your teeth and help to protect surrounding gums and soft tissues. For the best fit and comfort, we will take an impression of your mouth and create a custom-made mouth guard that will provide the protection you need. We also offer custom-made night guards which are an excellent option for patients who a grind or clench their teeth while sleeping, a condition known as bruxism. This condition can cause tooth damage, headaches and jaw pain if left untreated. For more information about our custom mouth guards, call us today at (248) 266-8581.